Overall I think it is good, but the lid lock handle is a bit loose May I be a bit more modest? I do not require so much tightness but looseness of anxiety. This review is about item#39531073. For rally off-road bike map box. It is inexpensive, strong, and highly airtight. Work is easy because the window can be opened with a normal cutter knife. I am using it in various ways because it is also possible to take crime prevention measures as a tool box & document case of a bike because two keys are attached. So it is the third repeat purchase. As there are three colors, it is also good to be matched with the bike color. This review is about item#37311145. 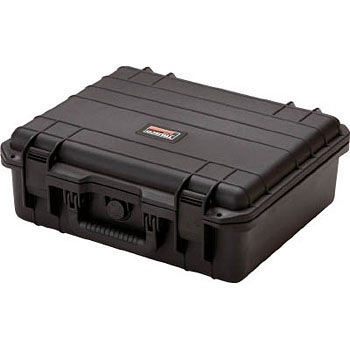 It is used as a storage case and a carry case for precision equipment than usual. The point where the size can be chosen, the durable point is good. I usually purchased it from another place but I was allowed to purchase it here with stock inventory as it was inventory out of stock. This review is about item#37311136. It's fine to build it, but it was painful that the inside sponge was not anti-static. It was a measuring device weak against static electricity, so electrostatic measures were troublesome. I wish I could write it in the item description. This review is about item#37311127. I thought the measuring equipment was held tightly and management and carrying was convenient. The case is also sturdy. Will it become a little sweet if the number of times the lock is used increases? I felt it. The size is M Test indicator × 2 / stand × 2 Including large and small was perfect. This review is about item#39531152. It is quite sturdy and useful. We expect that color variations will be developed. The making of the main body is also satisfied well. The sponge on the main body side of the two corrugated sponges becomes a hindrance when storing thick objects. I think that it is possible to respond to the thickness of the stored item as one sponge that can be cut is attached to the spare. This review is about item#39531064. I am using it for one year but I am very satisfied that it is firmer than I expected. It is cheesy feeling while looking at the exterior, but if you only want practicality without worrying about that part, you do not have to worry that you said that it is sturdy and rock becomes sweet. It is very solid and easy to carry equipment with confidence. You can cut out the urethane in 15 mm increments so you can make it fit the contents like a special case. This price is very affordable with this quality. In addition, it looks incomparable to a certain famous protector tool case abroad. I liked it very much. It was very nice to be able to process urethane freely to put some parts. I like the sturdy thing to send it as it is by Takkyubin but I think that it was better if there was a mechanism that would not easily detach the lock bar. I am satisfied just right size. By the way Bosch's rechargeable vibration drill is put in it. The strength is about enough. Sturdiness, hue, it looks good to use sponge inside. Although I have not reached use yet, I am satisfied with this making. This review is about item#39531116. It is used to store a set of electromagnetic field measuring instruments. It is used to store the measuring machine main unit, measuring element, temperature / hygrometer, etc. for storage. Because there is buffer urethane, it is safe to move by car. However, it is grateful for machining that the notches in the buffer urethane are included, but if the parts are repeatedly taken out and inserted, the gap will become large. A little harder to break is appreciated. The case is also useful because it is made of resin and key structure. Size and strength are good. Because it has a sponge and it can hold down contents, things will not move and it will not hurt. Actually the size was smaller than the original image from inside and outside dimensions, but it was no problem. I am saved because cut sponge is also attached from the beginning. The rigidity etc. are sufficient, and it can not be complained if it is this price. This review is about item#39531082. I use it for the storage and transportation of the import engine diagnostic terminal. Although we have purchased a total of four, we have not been flooded even strongly with shocks even with some rain. Depending on the thing to be stored, if it is greedy, is it good if the sponge with interior cut is a little harder? I think. There is a thing that a sponge is caught when it puts in and out and it is going off every block, and it is using while repairing with tape etc. · · ·. Overall I am very satisfied. I feel better a little better than the Pelican delusion being exhibited in the auction. I still worry that her tightness is all right as compared with the original one. If you are concerned with the price, I think this is enough. I am satisfied with the durability and cheapness of price which is inevitable with first-class manufacturer products. I love it because it can easily cut out according to the sponge inside. This review is about item#37311154. It is comprehensively well-made and easy to use. According to the shape of the object to be stored, since the cushion came through, the degree of freedom was wide, it was the correct answer you chose. It was good that the resin was light and the weight was light. The difficulty is that it is hard to grab a dial that keeps confidentiality. It is easy to operate if there are protrusions that can be grasped on the dial.